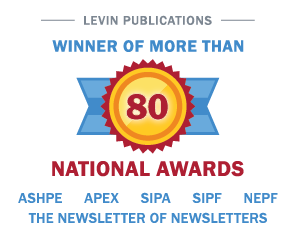 Published since 1964, this award-winning, subscription-based publication offers an exclusive group of advertisers access to the Senior Care decision makers: owners, operators, investors, developers, financial intermediaries, and professionals in senior living. With a legacy of credibility, the editors and financial analysts delve inside the private world of mergers, acquisitions, and finance. This digital newsletter delivers the latest, breaking news on senior housing acquisi- tions, financing and development updates. Reach an elite audience of CEOs, investors, advisors, owners, operators and developers in the senior housing and care market who rely on our insight and analysis. Interactive webinars with an expert faculty. Timely topics include the latest developments and financial strategies, growth strategies and best practices for seniors housing, assisted living, long-term care and CCRCs. Average webinar attendance is over 100. CEUs for owners/administrators. This annual keepsake edition covers the entire health care M&A market during the first sixteen years of the 21st century. Receives wide distribution at more than 40 senior housing and healthcare investor conferences. For the price of one ad, your message will be circulated all year. Don’t delay. Advertising space is limited. Published every quarter, this exclusive report provides detailed analysis of M&A activity in the senior housing and healthcare markets. Includes M&A developments, emerging trends, recent deal activity and summaries. Receives wide distribution at more than 40 senior housing and healthcare investor conferences. Reach key decision makers, extend your brand and position your company as a thought leader. Our professionally produced white papers are marketed to a select audience of more than 33,000 professionals in the seniors housing and care and healthcare M&A markets. Your message, Our List. Get your message out. Dedicated e-Blasts to readers of The Senior Housing Dealmakers Forum & News are an effective way to target your message—when and how you want—either to enhance branding or to bring in top quality leads—your choice. Reciprocal blasts only. Enhance your digital image. Customize your company or expert listing in the Industry Resource Center. Subject to approval by editorial staff.